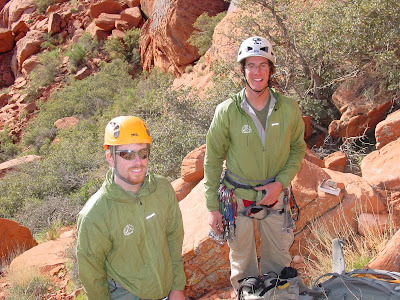 A few weeks ago, the American Alpine Institute participated in the annual Red Rock Rendezvous as a key sponsor. 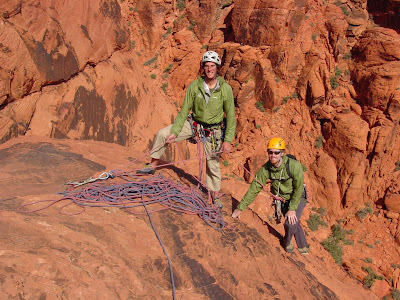 Eighteen of our guides attended the event and taught a variety of clinics and classes throughout Red Rock Canyon. We had a lot of guides around...and we couldn't resist. So we ran a guide training with a focus on multi-pitch rock guiding. Dawn Glanc, an AMGA Certified Rock Guide; Forest McBrian, an IFMGA Aspirant; and I, an AMGA Certified Rock Guide; ran the training...and it was awesome. Guides guided guides up and down routes like Alage on Parade (III, 5.7+), All that Jazz (II, 5.8), Physical Graffiti (I+, 5.7) and Community Pillar (IV, 5.9). Everybody had a great time and expanded their skills and knowledge. to Bellingham after he's all tuckered out.